Why Is The Alabama Deer Rut So Late? In the middle of the 20th century, Alabama embarked on an extensive restocking program, bringing in whitetail deer from as far away as Michigan, Ohio and Wisconsin to rebuild the herds. Also, deer from southwest Alabama were captured in relocated to other parts of the state. 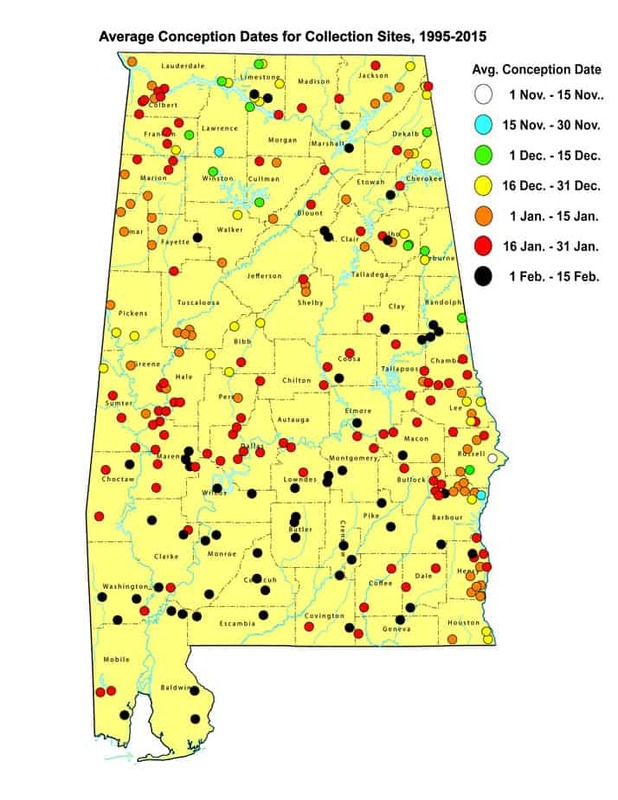 Due in part to all these different genetics, the rut for Alabama’s deer is literally all over the map. Sykes says that depending on which region of the state you’re hunting, deer might rut the first week of November, or in December or through January and into February. Sykes does says that rutting activity for most of the state is based on the genetics from the deer captured in southwest Alabama and relocated to other parts of the state. “The predominant rut is from the last two weeks of January through the first two weeks of February,” he said. Good. As you read this, I’m in Union Springs, Alabama, hunting for a few days. It is the first time I’ve ever hunted whitetails in February. The last few times I’ve hunted Alabama it’s been mid-January. On those occasions I thought I was a week or more early, so I decided to give February a try. On the map, the peak conception date (when does are bred) is anywhere from late January to February 16! Another thing on the Alabama rut. 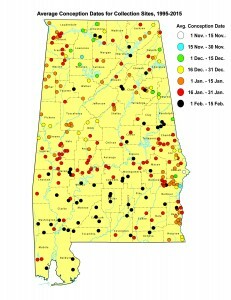 While states farther north and especially in the Midwest typically have a defined, distinctive rutting period of 10 days or so, it’s a “trickle rut” in Alabama, with spotty periods of rutting and chasing lasting four to six weeks or more. “That can (be due to) the age structure of your deer herd, or an unbalanced buck-to-doe ratio or hunting pressure (depending on region),” says Sykes. “Those deer are going to rut, but if you’re pressuring them hard, you’re not going to see them. They’re going to do it at night. “Also our weather is so crazy, it may be 85 degrees in January and those bucks aren’t comfortable chasing hard in the middle of the day. They’re going to do it at night.